3 for $93.75 total Need more quantities? This classic and carefree Rugosa sparkles with masses of intensely fragrant, 3″ semidouble blossoms that appear atop mounds of ridged dark green foliage. They are followed by decorative red hips in fall, and, with deadheading, you may find blooms and hips side by side. Rugosa Roses offer repeat bloom; exquisite fragrance; handsome, glossy foliage; and outstanding hardiness. Their tolerance for wind, salt, sand, and neglect makes them a superb choice for difficult situations such as seaside gardens. Their colorful hips are a bonus. Grafted. Roses offer colors, perfumes, forms, and habits to suit every garden situation. The tenacious efforts of breeders have yielded Roses with the best attributes of different varieties in new forms. Hybrid Teas, lovely as ever, now combine long bloom periods with the vigor to shrug off pests. Shrub Roses bloom for months, rather than weeks, in addition to their ever-appealing hardiness and longevity. A new group is so exceptionally long-blooming and carefree that they are simply called "Landscape Roses." In short, these are not your grandmother’s, or even your mother’s, finicky Roses. Simply choose according to your circumstances. Roses require 6 or more hours of direct sun per day and a fertile, reasonably moist soil. For more information on Rose care, click on Growing Guide. Rugosas are my favorites. I stuck Blanc Double de Coubert into a very crowded border just fifty feet off the sand—and despite absolutely no care it blooms its fool head off and can be smelled (Oh! that scent!) from clear across the property. When I want to scent a bouquet, I add a single bloom. I also have the reliable and colorful Hansa and the close-scented pink single both listed here and which are lovely; and a scented single white and pink Grootendorst, which is vigorous but, without scent, not in the same league. Planting: Before planting a bareroot Rose, remove and discard the packing material and soak the roots for a few hours. Then dig a planting hole that allows sufficient room for the depth and spread of the roots. (If you’re planting a Climbing Rose, locate the hole so that the base of the Rose will be about 1′ from the foot of the trellis.) Discard 1/3 of the soil dug from the hole and replace it with at least as much organic matter—such as compost, aged manure, or leafmold—and mix this into the remaining soil. Next, set the plant in the hole so that the bud union (the bulge where the top was grafted onto the rootstock) or the point where the first branch leaves the main stem (on Roses that were not grafted) is 3″ below the surrounding soil in the North, and at the same level or an inch above the soil in mild-winter climates. Then push the mix of soil and organic matter back into the hole, tamping firmly as you go. Water thoroughly. Mound soil around the canes to a height of 12–15″. This prevents the canes from drying out in the sun and wind. Check the canes every couple of days, and remove the mounded soil gradually once new growth appears. Light/Watering: Roses grow best where they receive at least six hours of direct sun per day; more sun means more blooms and prevents leaning, leggy plants. Newly planted Roses need the equivalent of one inch of water per week throughout their first growing season. If water doesn't fall from the sky, you must supply it. A generous layer of organic mulch (compost or composted manure is best) helps keep the soil evenly moist. If weather is dry in the fall, be sure to water Roses well. Never allow the foliage to remain wet into the evening; water early in the day. Roses grow more vigorously, bloom more prolifically, and show greater resistance to diseases if fertilized several times during the growing season: in early spring (except the first spring after planting), immediately after the first wave of bloom, and again in early August. 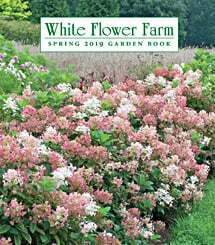 Gardeners in the South and West may wish to fertilize monthly from early spring until June, pausing during the heat of summer, and fertilizing again in August and September to close out the season. We prefer natural fertilizers such as fish emulsion or seaweed extract, applied in solution, because they release their nutrients more slowly and evenly than chemical fertilizers. Roses adore composted horse manure, but so do weeds. If you're willing to face the consequences by all means provide this treat as topdressing in spring or as winter mulch, and the Roses will reward you for your efforts. Species Roses should be fertilized just once in early spring with granular fertilizer such as 10-10-10. Pests/Diseases: The Roses we offer were selected for their vigor and their resistance to pests and diseases. If planted and grown as we suggest, they will be healthy and healthy plants are much less troubled than plants under stress. Even if a healthy plant does suffer at the hands of a pest or disease, it will likely endure and recover without intervention on the part of the gardener. Some Roses are prone to fungus problems (such as black spot) in hot, humid areas. Cleaning up old foliage and cutting back affected canes is important for disease control. Spraying the leaves with Bordeaux mixture, a copper-based fungicide, can help once symptoms appear (follow the manufacturer's instructions) and a single application of lime sulfur applied in early spring while plants are still dormant will go far to prevent problems. Japanese beetles and Rose chafers may be handpicked or a systemic pesticide may be used. In spring, check for Rose slugs (sawfly larvae that appear as tiny, green caterpillars and skeletonize Rose foliage) and physically destroy them or spray with superfine horticultural oil. Companions: Roses bloom at the same time as Peonies, Clematis, Delphinium, and Lilies and are ideal with many other perennials. Train non-climbing Clematis through larger shrub Roses and grow viticella and texensis Clematis varieties with the climbers. Pruning: Prune Roses to remove deadwood, to control or direct growth, and to promote flowering. Wait until growth breaks from the canes in early spring before pruning. Deadwood can be removed at any time. Other pruning should be done in early spring on climbers, rugosas, English, and modern Roses. At that time, remove any weak or crossing branches. Remove a few of the old canes at the base of established climbers to stimulate new growth. If the Rose bush has become too tall, the stems may be cut back by one-third to one-half, pruning to an outward facing bud to direct growth away from the interior of the plant. If you grow once-blooming old-fashioned Roses, do not prune until after flowering is finished. With the exception of the rugosas, which produce attractive hips (fruits), remove the spent flowers of reblooming Roses to promote more bloom, cutting the stems back to the first large bud at the base of a set of five leaflets. Please note: 'New Dawn' reblooms best if stems are cut back to the second set of five leaflets. Grafted Roses will occasionally send up shoots from the rootstock, which should be removed as soon as noticed. Reflowering: Many varieties of Roses available today will bloom continuously or more sporadically through the growing season. Always remove spent blooms, and cut the stems back to right above the first leaf with five leaflets. Please note: 'New Dawn' reblooms best if stems are cut back to the second set of five leaflets. Transplanting: Roses may be moved in early spring when dormant, especially if they are young plants. Large, established Roses are more of a challenge. End-of-Season Care: Much has been written about techniques for overwintering Roses in cold climates. In our experience, the best way to get Roses through winter is to choose plants adapted to your climate zone. That said, if you live near a Rose's cold limit and you garden on an exposed site or in an area where rapid temperature fluctuations are common, you should mound two shovelfuls of composted manure, garden soil, compost, or shredded leaves over the base of the plant in late fall after the ground freezes. Covering these mounds and the lower parts of the bushes with evergreen boughs will add protection. Pull the mounding material away from the stem as new growth emerges in spring. Do not prune Roses back in fall; wait until you see growth start along the canes in spring to prune branches injured over winter. 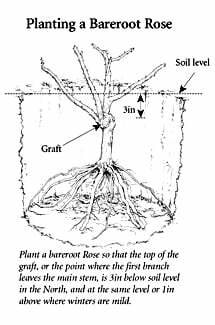 Early spring: Plant bareroot Roses now and transplant young Roses if needed. Check soil pH and add lime if pH is below 6.5. When new growth appears along the canes, prune established Roses to shape the bushes, remove dead or damaged tissue and open up the interior to allow for good air circulation. Remove a few of the old canes at the base of established climbers to stimulate new growth. If fungal disease is prevalent in your area, spray while dormant with Bordeaux mix, lime sulfur, or horticultural oil. Fertilize now. Gardeners in the South and West may wish to fertilize monthly from early spring until June, resuming in August and September. Mid-Spring: Watch for Rose slugs and either handpick, spray with a superfine horticultural oil, or use a systemic insecticide. Fertilize Roses again after the first flush of flowers. Watch for shoots coming from the rootstock below the graft and remove. After the soil warms, apply a generous layer of organic mulch. Late spring: Monitor plantings for Japanese beetles and Rose chafers and treat as needed. Watch for black spot, powdery mildew, or other foliar problems and treat with fungicides or Neem products. Water early in the day so that foliage dries off before evening sets in. Summer: Clean up any fallen foliage and be diligent with deadheading. Continue watering if rainfall is sparse and keep Rose beds weed-free. Some varieties of Roses may need support, especially if summer thunderstorms occur in your area. As climbers send out new canes, tie them to the trellis or fence. Fall: If you live in a cold climate and grow Roses that are not completely hardy in your area, you may wish to protect them for the winter by mounding soil or compost around the base of the plants after the ground freezes, and then adding evergreen boughs. Climbing Roses may be detached from their supports, laid down on the ground and covered with soil to get them through the winter. This procedure is viable only on the smaller climbers, but does work well with shorter Roses grown on pillars.